March just concluded and already weather and climate disasters in the United States have cost more than $3 billion dollars and 34 lives in 2018, according to the National Oceanic and Atmospheric Administration. One storm hit the southeastern part of the country while two others took on the central and eastern regions causing severe damage in their wake. The storm that hit the southeast in March was accompanied by strong winds along with hail and more than 20 tornadoes. That storm caused more than $1 billion in damages and three of the 34 deaths caused by climate and weather disasters so far this year, according to NOAA. Several other states across the country got late-season nor’easters that dropped feet of snow from Pennsylvania to Maine. Two were deadly but there were four storms total that broke snowfall records in Boston, Philadelphia and Albany. In all, the country-wide temperature was 1.1 degrees Fahrenheit above average in March with slightly above average precipitation. The climate and weather disasters of 2018 will be added to the list of 219 others that cost $1 billion or more in damage that has been kept since 1980 on events in the U.S. In 2017 alone, there were 16 events that cost at least a billion dollars including the hurricanes, wildfire, floods and droughts the country saw. 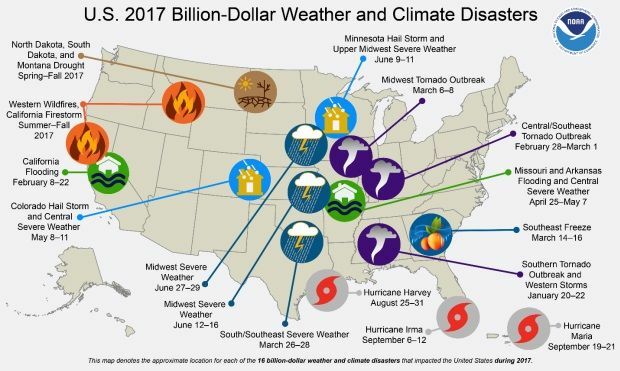 Last year tied 2011 for the most recorded weather and climate disasters and it cost nearly roughly $90 billion more than the most expensive year did. The year that previously cost the most in damages was 2005 when hurricanes Katrina, Dennis, Rita and Wilma all hit. The last three months have put 2018 ahead of 2008, 2011, 2012 as well as the average amount of money weather and climate disasters usually cost by the end of March, according to data from NOAA.